This is another image I captured after looking for water collecting in fields this spring. 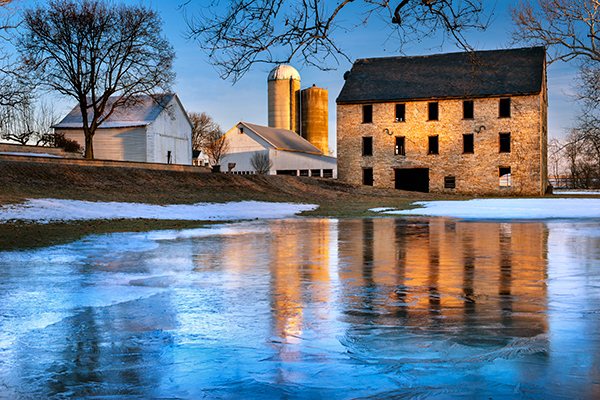 This old mill sits right along the road and with just a short walk down the bank here,I was rewarded with the morning sun creating this lovely reflection in the ice.A barn across the street adds to the composition in this country scene that would make a gorgeous painting. 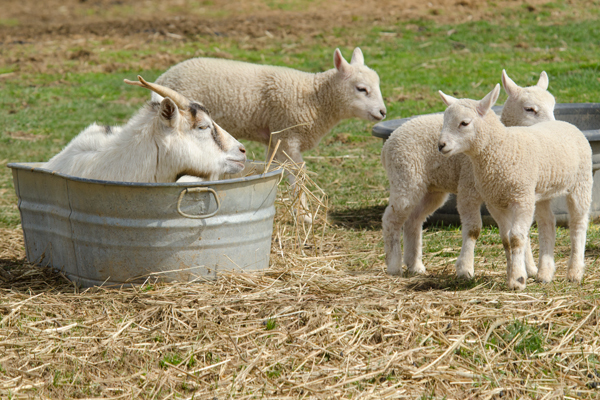 The old goat seems to have decided he needs to not only eat some hay,but he also chose to take a siesta in the food trough while he was at it. The one young lamb seems to want to call him out on his rude behavior ,but after seeing the horns,he decided to just give him the stare down.It was a bit breezy this day,so maybe the trough gave a little wind relief. 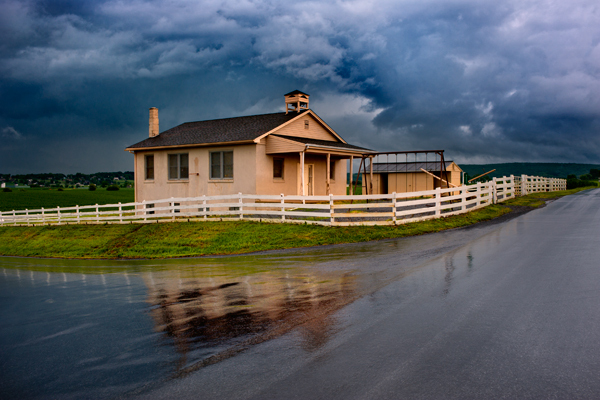 These two images were shot on the same evening,so I figured I would share them together. Heavy rains were punctuated by brief times of no rain,which kept the roads glistening and a bit reflective,which I used to my advantage in getting the shots. I actually went out for lightning,but it did not flash once all evening.One trick I use when leaving my tripod and camera set up in rainy weather is to put my trucks rubber floor mat over the gear to keep it from getting wet. That works in all but the rainiest or windiest times. 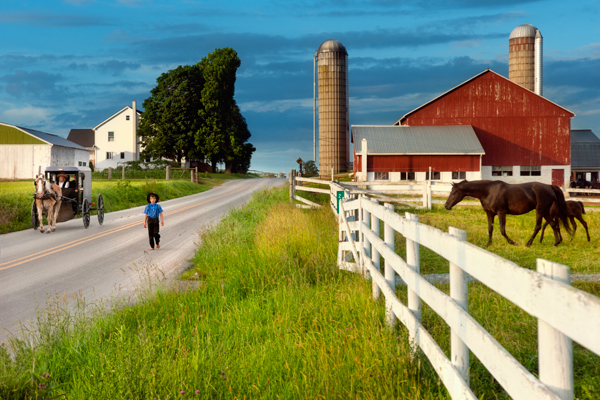 This farm and fence shot proves that a mediocre scene can become a winner with the right light. 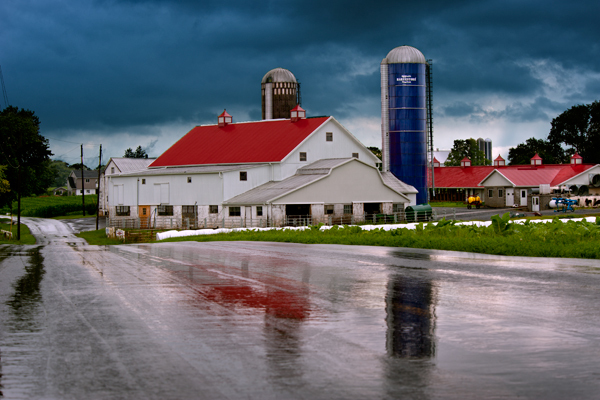 I have driven past this spot dozens of times and never gave it a thought before,but late evening sidelight and a dark sky behind the barn made me pull over on this occasion. I liked the leading line of the fence but hated the empty road,so I decided to sit till dark if necessary to get a buggy or something interesting passing by. Well I sat and sat,and thought you got to be kidding me that no buggies are out tonight,and an hour in this lone buggy came trotting by just as the youngster was coming to feed the horses. He looked so serious,I thought he was going to say get lost,but he merely fed the mother and colt. 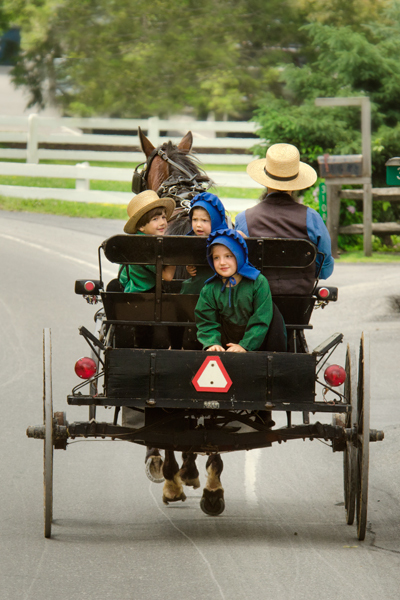 One thing I remember about this evening was the group of Amish kids at the farm behind me who were watching me from behind the raspberry bushes and when I would turn they would duck,as if I had no clue they were there.Finally one got brave enough to move closer and smile and wave.They are always intrigued by the camera on the tripod and must have wondered what this idiot saw that was worth waiting so long for.It was the only shot I got that night but was well worth the drive in my opinion. 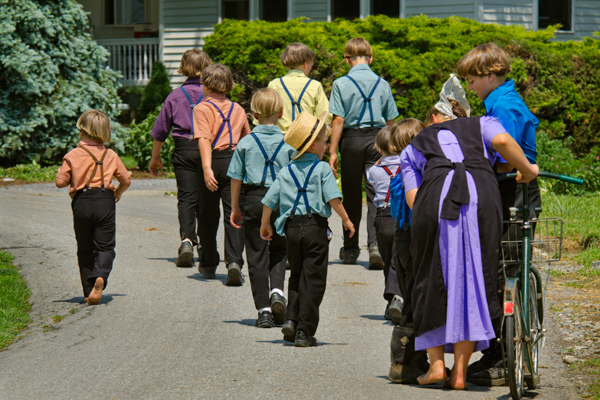 A group of Amish boys head up the driveway on a recent summer day. The older female is scolding the one boy for something I am sure he deserved. Suspenders are the standard choice for keeping the pants up. I guess the seat was full up front,so she got the whole bed of the buggy to herself. Hopefully anyone that reads this will know what a shindig is, but if you don’t, it is another word for a get together or party. 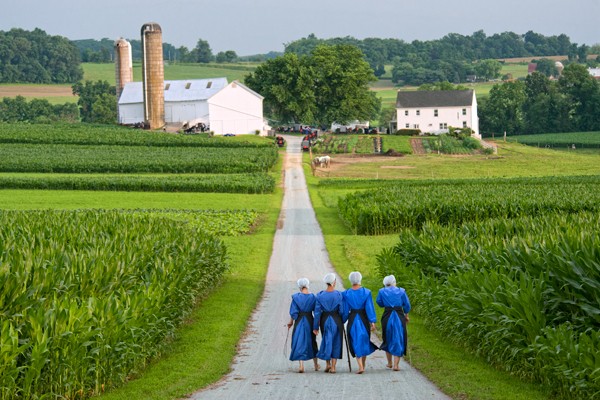 Not that the Amish are party people but they do know how to have fun too. In this image I could see volleyball nets,guys talking around the back of the barn and a group of girls laying in a circle on the grass chit chatting. I was driving around looking for scenery and saw this lane leading in,and as I debated whether to shoot it or not,I saw a group of 4 girls heading toward me with walking sticks. I waited till they headed down the lane to snap any photos and although they are a small part of the shot,I think it turned out nicely. Sweet corn is growing on each side of the lane and should be in abundant supply this year.